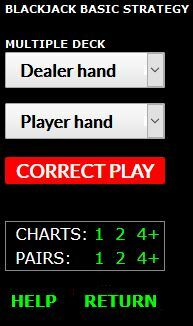 Every page on the Blackjack Review Network web site has a small app that will calculate the correct basic strategy for a given dealer up-card and player hand. You will find this app at the bottom of every page. Click on either image here to view the app now or scroll to the bottom of the page! If you notice any problems with the app, please report it here. This app was originally written by Henrik Rasi and modified extensively by Michael Dalton. This app gives the correct basic strategy for a multiple deck game. The default rule is S-17 (dealer stands on soft-17) but you will be informed of any H-17 fine points and both the DAS (double after splits allowed) and no-DAS decisions are provided. Also, direct links to all color charts (multi-, double- and single-deck are provided. Note that each chart has two sections: one for player hands of 8 through A8 and one for all the pairs.1)Yes, of course you should always just “hit” a hard hand less than 8 (unless it is a pair) and stand on an A9 (20). 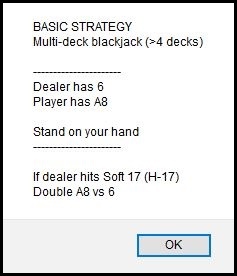 For more information and complete basic strategy charts, check out the basic strategy section in the Encyclopedia of Blackjack (Twenty-One). 1. ↑ Yes, of course you should always just “hit” a hard hand less than 8 (unless it is a pair) and stand on an A9 (20).